Family members and first responders gathered with Nova Scotians Sunday afternoon to remember the victims of Swissair Flight 111, which crashed off Peggys Cove killing all 229 aboard. 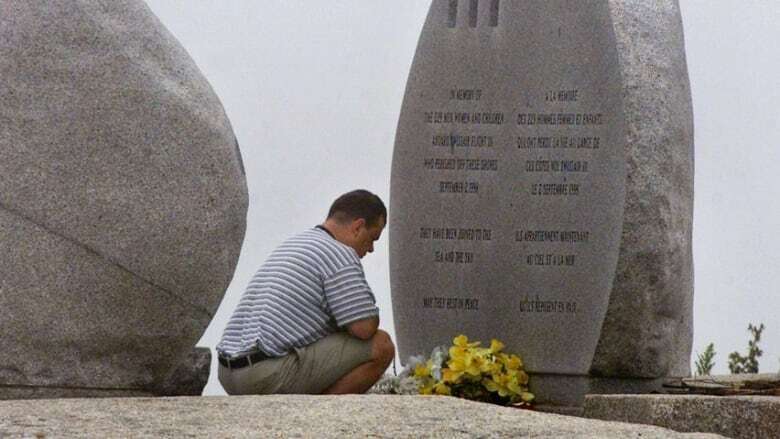 Twenty years ago today, thousands of lives were changed forever when Swissair Flight 111 fell from the sky into the waters off Peggys Cove, N.S. 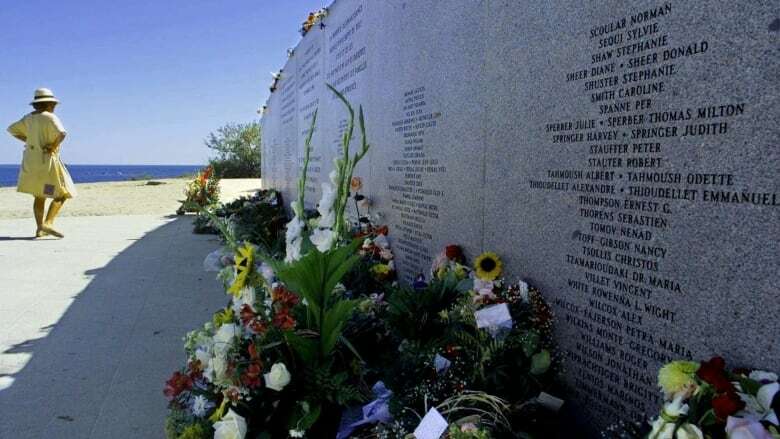 All 229 people aboard died in the crash, which left an indelible mark on members of the communities around St. Margaret's Bay, including thousands who responded to the disaster. A memorial service to remember the victims of the crash was held Sunday at the Swissair Memorial Site in Bayswater, N.S. For community members and loved ones of the victims, it's a chance to remember those who died and recognize those who worked in the aftermath. Awoken by a loud boom and the sound of sirens, fishermen from the area were among the first to respond to the disaster the night of Sept. 2, 1998. "They were so used to going out to some kind of danger … they did it instinctively," said Stephen Kimber, author of Flight 111: The Tragedy of the Swissair Crash. "They just jumped in their boats and took off to go out there, and of course they were greeted by this horrific scene." The fishermen found a debris field that was covered in jet fuel, wreckage from the plane itself and body parts. It was a scene that they "did not expect and were not prepared for," Kimber said. "So that first night was a really horrific time for those people." Bob Conrad had dozed off after a long day of fishing, but woke up to the sound of a newscast, saying an incident happened near Peggys Cove where he had been fishing earlier in the day. "I knew that my fellow fishermen would be there, and I needed to be there," said Conrad, who could smell the jet fuel before he got to the scene. On the water, he spotted what he thought was a doll. But when he got closer, it was a child, he said. "My mind has not been [able] to retain the sight. And I'm ever thankful for that," said Conrad, who brought the child's body aboard his boat. As dawn broke and the sun rose over Peggys Cove, more volunteers and first responders joined in the recovery. For many of the people who participated in those recovery efforts, or who lived in the area, the effects reverberated long after the recovery mission itself wound down. "Six thousand people from Nova Scotia sought counselling after the crash of Flight 111, so you realize how many people were involved," Kimber said. "The way in which the community responded — the way in which people responded in Nova Scotia more generally — is something we can as Nova Scotians be proud of." The daughter of two crash victims said she's grateful for the "loving support" she received from Nova Scotians, but worries about those who were traumatized by the crash. Claire Mortimer lost her father and stepmother who were on board the plane. In the aftermath of the disaster, Swissair flew the family members of victims, including Mortimer, to Halifax. "It was a very emotional thing. Immediately, as soon as I heard the news, I felt like I had to be here," she said. Some of the victims' relatives ended up moving to the province, in order to be closer to the place where their loved one spent their last moments. Others have visited repeatedly since 1998, as Mortimer has done. "I can't even tell you how many times it's been. "And once I came here, I was treated with such incredible compassion and support and love by the people here that I just had to keep coming back." But Mortimer, a nurse practitioner who lives in Maine, is concerned that some Nova Scotians have not received the support they need. "What needs to be recognized, and is hidden somewhat, is there seems to be a large number of people who were involved in the gruesome task of sorting out the aftermath of the crash. "And it has been brought to my attention that there are people who are suffering 20 years later." Mortimer said she has spoken with family members of people who helped with the recovery effort and developed post-traumatic stress disorder as a result. She said she has been told about two people who killed themselves because of that trauma. She said she considers those people "to be victims of Swissair as much as my father and stepmother were victims of Swissair." Mortimer plans to attend today's memorial service and said this won't be her last time in Nova Scotia. She plans to come back and host free workshops on techniques to help people who have PTSD, aimed at mental health workers and clergy. She hopes it will help those who are suffering heal.